After our discussion of prose poetry the other day. Not to get into a large debate, but one thing to consider: Poetry written in prose form does not have to be narrative--it can be more or have more lyrical qualities (and i agree that most poems we read today share both qualities). It seems that there is an assumption with prose poetry that it has to have a linear narrative. And this assumption is when the blurring of flash fiction and prose poetry seem to exist. 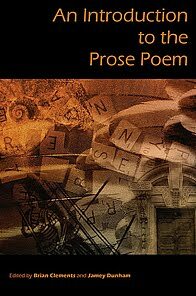 Rather, we should look at a prose poem as a poem (whether more lyrical/narrative/linear/ broken/hypotactic/ paratactic/etc) and see it as a choice not to consider line breaks. However, all the other elements exist. language, image, sound, etc. In these following two poems, for me, there is a bombardment of the senses and in that I am left with an emotion. I am not concerned with a linear narrative or what is happening or what it means. Never hits us the day it’s lovely gathers us up in its name who pierced the shower 40 below the heel hidden shoes the ruined exercises the shine is all night again pleasure falling off parting the bed during the biting lust. Today we speak above the noise a spyglass littered with soot scenes from the ruins boys and partners before the big bite imitating that’s the penalty denial of gain through pranks the essence of belief. I knew the world of incantations under the sheets of the neck line of the teeth behavior cloth the earth that we know we will go on rubbing. There’s this Lady she has been my friend for some years now and later glee pills a light bulb a tongue saying the damage is done by hands over a period running overtime puzzles rising for some years journeys arms legs learning what is yours love change love emember across passion truly going into the earth No that was another earth how many goats were there on it her and her father movies glazed motives: Put the books back the brown hair simple ways premonitions chance bugles calling the powder flat white in yellow air throbbing then going on off a light lady dark lady cool nights meaning years of writing this news shunted aside before a girl whom you all know and recognize flashing on then off hear lifelong release in these intimate gaits.